Joanne White posted Sunday February 10, 2019. Qualifying got underway with twenty-six cars taking to the track for a series of qualifying runs. Luke Oldfield topped the leader board with a quick 11.684 second lap, while Andrew Scheuerle, Peter Lack, Dan Murray and Ben Hilder rounded out the fastest five. The top four cars were all in the eleven-second bracket, while the quickest thirteen were separated by less than one second. Brent Kratzmann beat Andrew Corbet by just 0.006 seconds, while Phill Foster beat Steve Greer by just one thousandth of a second. Heat one started with Sean Rose and Steve Greer from the front row, with Phill Foster and Andrew Corbet close behind. Rose got the jump when the lights went green and quickly secured the lead, while Corbet quickly made his way between Foster and Greer and slipped into second leaving Greer in third. Luke Oldfield was already starting to make his way forward from towards the rear of the field and soon made his way into fourth before getting past Greer and setting his sights on Corbet. Greer brought the race under caution when he spun the beautifully presented Q84 racer, with Rose to lead the field back underway. Once the race resumed Oldfield wasted no time at all and quickly slid underneath Corbet to move into second and switched his focus to Rose and the race lead. Oldfield was determined and while Rose ran a strong race, Oldfield was relentless as he searched for a way past, eventually getting the job done on the high side as they came out of turn two a few laps from the chequered flag. Rose held down second for a few laps but came under relentless pressure from Corbet and Kratzmann, the pair eventually finding a way around the top side and relegating Rose back to fourth. Luke Oldfield got the win ahead of Andrew Corbet and Brent Kratzmann, with Sean Rose fourth across the line. Phill Foster was officially fifth and led Andrew Baumber, Karl Hoffmans, Steve Greer and David Kenway home. Mitch Gowland and Anthony Lambert shared the front row for the start of heat two, with Gowland getting the initial jump, only to quickly surrender the lead to Lambert as they rounded the first corner. Allan Woods was magnificent from position four, following Lambert around the high side of Gowland and into second before setting his sights on Lambert and the race lead. Woods however made a small mistake in turn two a few laps later, running a fraction too high and giving Gowland the opportunity to race through on the bottom. Gowland did not hesitate and quickly regained second, while mid field Andrew Scheuerle closed in on the back or Ryan McNamara and, at the tail of the field, there was an intense three-way battle between Libby Ellis, Jason King and Trent Vardy. Vardy eventually managed to get underneath King and then around Ellis as the laps wore on, while at the front of the field Woods closed in on Gowland and began challenging for second once more. Anthony Lambert got the win in the Q90 racer, with Mitch Gowland crossing the line in second ahead of Allan Woods and Ryan McNamara, with Andrew Scheuerle, Ben Hilder, Trent Vardy, Jason King and Libby Ellis rounding out the finishers. Heat three saw Geoff Davey start from pole position with Kristy Bonsey alongside and Brett Minett and Randy Morgan right behind them. Bonsey got a brilliant start and quickly secured the race lead, while Randy Morgan got around the outside of Davey to secure second. Peter Lack raced underneath Davey as they rounded turn two to move into third, but it was hard to take your eyes off Morgan as he closed in on the back of Bonsey and began challenging for the race lead. Morgan had a couple of looks on the inside of the Q42 racer but could not quite make it through, with the race soon brought under caution for the spun car of Minett in turn two. Bonsey led the restart from Morgan and Lack with seven laps left to run and while Bonsey continued to lead for a several laps, Morgan was magnificent as he patiently searched for a way into the race lead, eventually sliding beautifully underneath Bonsey as they rounded turn three and taking control of the race. Lack got underneath Bonsey half a lap later while the race was brought to a stop soon after when Davey upended the NQ74 racer on the back straight. Morgan led the restart from Lack and Bonsey with only three laps left to run, but there was no stopping Randy Morgan as he raced to victory, leading Peter Lack, Kristy Bonsey, Dan Murray and Brett Minett across the line. Geoff Davey, Scott Johnston and Justin Snellman all failed to finish the event. Andrew Baumber and Phill Foster shared the front row for the start of heat four, and while Baumber led initially, Foster soon raced around the high side to secure the lead less than half a lap into the ten-lap affair. Randy Morgan quickly followed Foster on the high side, while Baumber faded as Ryan McNamara came charging through on the bottom. Brent Kratzmann and Luke Oldfield negotiated over positions mid-field, with Kratzmann holding the advantage and Oldfield charging around the top side trying to find a way past. Kratzmann got underneath Baumber, with Oldfield finding a way past shortly after, while Morgan made his way past Foster and took control of the race. Kratzmann closed in on the back of McNamara, with Oldfield soon joining the pair in a thrilling battle for the minor places. Kratzmann searched for a way past McNamara, while McNamara refused to surrender the position, and Oldfield tried to find a way past them both. Kratzmann had a big look underneath McNamara but ended up surrendering a position to Oldfield who was racing around the top side with just one lap left to run. Randy Morgan got the win ahead of Phill Foster and Ryan McNamara, with Luke Oldfield home in fourth ahead of Brent Kratzmann, Andrew Baumber, Jason King and Karl Hoffmans. Sean Rose and Kristy Bonsey led the field to the green in heat five, with the first start aborted and Rose relegated to the second row for the restart after officials deemed him to have gone a little too early first time around. Brett Minett was elevated to pole position for the restart, but it was still Bonsey who secured the lead when the lights went green. Minett settled into second ahead of Ben Hilder and Peter Lack, with Lack making short work of finding a way past both Hilder and Minett. Lack began closing in on the back of Bonsey and started challenging her for control of the race, but Bonsey was not prepared to surrender the lead. Lack looked around the high side of Bonsey but tagged the wall coming out of turn two, the right rear wheel parting company with the Q5 racer as he entered turn three. Lack made further contact with the wall and left Minett with nowhere to go. Minett collided with the back end of Lack and inverted his own Q94 racer, bringing the race to a stop within sight of the chequered flag. The race was declared with Kristy Bonsey the winner and Ben Hilder inheriting second ahead of Andrew Corbet, Sean Rose, Trent Vardy and Geoff Davey. Brett Minett, Peter Lack and Justin Snellman did not finish the event. The final heat of the night saw Steve Greer start from pole position with Mitch Gowland alongside and Anthony Lambert and Allan Woods sharing the second how. Gowland quickly secured the lead when the lights went green, with Woods having a quick look on the outside of the Q84 racer of Greer before switching to the bottom to move into second. Current Australian Champion Andrew Scheuerle made his way past Anthony Lambert before displacing Greer a few laps later and turning his attention to Woods. Scheuerle had a few big looks on the inside of the Q28 racer of Woods but could not quite find a way through, eventually getting the job done in lapped traffic late in the race. Woods fought back with one lap left to run, while Scheuerle closed in on the back of Gowland, but there was no stopping Mitch Gowland as he took the win ahead of Andrew Scheuerle, Allan Woods, Anthony Lambert, Dan Murray, Steve Greer, David Kenway and Libby Ellis. Luke Oldfield led the points heading into the dash but his uncanny ability to unwittingly draw position eight in the pre-dash draw remained strong last night and he once again drew position eight to start the Dash event from the rear of the field. Allan Woods started the event from pole position, but a deflated left rear trye before taking the green was going to impact his race. Andrew Corbet shared the front row with Woods for the start but was Woods who secured the lead when the lights went green. Andrew Scheuerle settled into second ahead of Andrew Corbet, while Brent Kratzmann had a brilliant run on the bottom, racing underneath Randy Morgan, Dan Murray and Ben Hilder in the less than half a lap to advance from seventh to fourth by the time they hit turn two. Hilder immediately fired back, regaining his position from Kratzmann, the pair putting on a breathtaking show as they negotiated over the minor places, with Kratzmann quickly challenging Hilder once more. Kratzmann and Hilder raced side-by-side as they completed the first lap, while behind them Morgan and Murray came together and brought the race under caution. Neither Murray nor Morgan were able to restart the event, with Woods leading Scheuerle and Corbet back to the green. Scheuerle wasted no time in moving underneath Woods just half a lap into restart, while Oldfield took to the high line and raced around Kratzmann and Hilder in less than a lap before turning his attention to Corbet. Andrew Scheuerle went on to take the win, while Allan Woods managed to hold off a very determined Luke Oldfield to cross the line in second. Oldfield finished third ahead of Andrew Corbet, Brent Kratzmann and Ben Hilder, while Dan Murray and Randy Morgan both failed to finish the event. Sean Rose and Steve Greer shared the front row for the start of the B-Main event, and while Rose led initially Greer soon raced around the top and secured the lead half a lap into the race. A caution a few laps in for the spun car of Trent Vardy in turn two left Greer leading from Rose, Brett Minett and Andrew Baumber with ten laps to run. Minett raced underneath Rose as they rounded turn two moments after the race resumed, while deeper in the field Karl Hoffmans made his way through on the low side of Geoff Davey. Jason King got into the wall in turn two, bringing the race back under caution, with Greer, Minett, Rose and Baumber to lead them back to the green. Greer slammed the back straight wall a few laps after the race resumed, surrendering the lead to Minett before limping the Q84 racer to the infield with five laps still to run. Minett had a very comfortable lead while the battle for the minor places behind him started heating up. Rose held down second while Hoffmans and Baumber exchanged positions several times. A spun car in turn two brought the race under caution with two laps still to run, but when Rose slowed as the yellow lights began to flash Baumber rode his wheel and launched the NQ2 racer high into the turn one fence, changing the yellow light to red. Baumber managed to walk away from the wreck, but received medical attention from the paramedics at the track. With time getting away and inclement weather approaching the race was declared with Brett Minett getting the win ahead of Sean Rose, Karl Hoffmans and Geoff Davey. Libby Ellis finished fifth ahead of David Kenway, Trent Vardy and Scott Johnston, with Andrew Baumber, Steve Greer and Jason King all failing to finish the event. Andrew Scheuerle and Allan Woods shared the front row for the start of the thirty-lap A-Main last night, with Scheuerle getting the jump when the lights went green and quickly settling into what would become an unassailable lead. Woods held down second while Brent Kratzmann quickly displaced Ben Hilder and Andrew Corbet and set his sights on Luke Oldfield. Oldfield challenged Woods for second but soon came under increasing and unrelenting pressure from Kratzmann. Kratzmann eventually got around Oldfield as they game out of turn two and set out after Woods, while deeper in the field Kristy Bonsey was doing a magnificent job and had made her way ahead of Anthony Lambert. Scheuerle began to make his way through lapped traffic with twenty-four laps still to run, while Woods and Kratzmann began closing the gap as the lapped traffic really came into play. Kratzmann had a big look on the inside of Woods as they rounded turn four but could not quite get the job done, before trying again a few laps later and this time managed to get past on the inside of Woods as they rounded turn one. Woods of course fought back but Kratzmann had already shifted his focus to reeling in Scheuerle, weaving his way through the traffic with remarkable car speed and starting to close the gap ever so slightly to the race leader. Kratzmann lost a little ground on Scheuerle when he became boxed-in by two lapped cars, but his race nearly ended in disaster when contact with Kristy Bonsey in turn three almost ended his race. Bonsey was left stranded on the track high in turn three, leaving Luke Oldfield nowhere to go. Oldfield, who had been challenging Woods for third, spun the Q17 racer in an effort to lessen the impact but contact was unavoidable. Bonsey was unable to restart the event, and while Oldfield did take the green on the restart he pulled out of the event soon after. Andrew Scheuerle got the win ahead of Brent Kratzmann and Allan Woods, with Peter Lack home in fourth and Andrew Corbet rounding out the top five. Randy Morgan was impressive as he raced home in sixth and led Anthony Lambert, Ben Hilder, Ryan McNamara, Mitch Gowland, Phill Foster, Karl Hoffmans and Geoff Davey across the line. Luke Oldfield, Kristy Bonsey, Brett Minett, Sean Rose and Dan Murray all failed to finish the event. 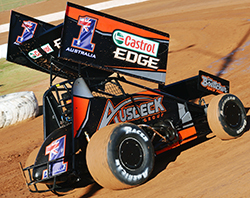 Sprintcars Queensland will now have next weekend off before returning to Ausdeck Patios and Roofing Archerfield Speedway on Saturday 23 February 2019. See you trackside!